Percy Henry Neale is not listed on the War Memorial in Station Road but he is remembered on the Think and Thank Screen in the church and also on the Roll of Honour. Percy died in 1917 a month after Robert William Barker who was his neighbour at No 3 Bridge Cottages. His father Alfred John Neale was a boiler-smith at the Ryburgh Farmers' Foundry and when Percy enlisted he was working as an Iron Moulder alongside his father at the Foundry. He was 5’ 91/2” tall and weighed 128 lbs with blue eyes and brown hair. He went to France for the first time on May 5th.1915 and had two short spells admitted to 14 Field Ambulance in Dec 1915 with 7 days furlough following in mid January 1916 and again to15 Field Ambulance in April 1916 with a further 7 days furlough (in Ryburgh) in the last week in May. Promotion followed the following month when he was made an unpaid L/Cpl and being paid for the privilege at the end July 1916. He was made up to “substantive” Corporal in November that year. 11 Canada Field Ambulance France. Wounded from 5th Division operations brought to the M.(ain)D.(ressing)S.(tation)"
Belt, Photos, Letter, Cigarette case, cards, 1 religious book, 1 wrist watch, 1 card 2 wallets , 2 note books. The past month has been a sad one for Ryburgh. Three of our "boys" have laid down their lives for us at the Front, namely Frederick John Bone, Walter Fenn and Percy Neale, and to their relatives, and in this I feel sure I voice the feelings of you all, when I extend to them our very deepest sympathy. The entry in the margin of F.H.Tatham's Preacher's book now held by the Norfolk Record Office as part of the Ryburgh Parish Documents. 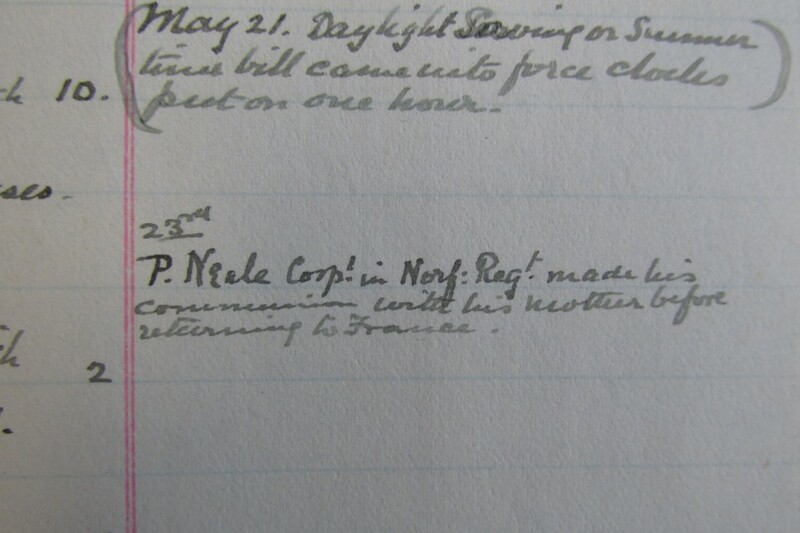 Again, in the above Preacher's book, recording the date of the Requiem Mass for Percy Neale. No further Requiem's for Ryburgh's dead soldiers were recorded after Percy's death.